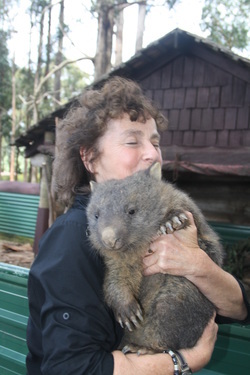 Deirdre Kessler (with Lily the Wombat) - photo courtesy of author. ​Deirdre Kessler, a poet, novelist, and author of educational texts, was born in the United States but relocated to Prince Edward Island during the Vietnam War. Kessler began her writing career with The Private Adventures of Brupp, a young adult novel, in 1983. Since then she has published a dozen works of young adult and children’s fiction which have been translated into French, Dutch, and German. Additionally, she has released two poetry chapbooks, Subtracting by Seventeen (Saturday Morning Chapbooks, 2005) and Rearranging the Sky (Indigo Press, 2007), and one collection of poetry, Afternoon Horses (Acorn Press, 2009). Her poems have also appeared in various journals and literary magazines. In addition to her writing career, Kessler has worked as an arts reporter with the CBC and hosted CBC Radio’s children’s program “The Story Show.” She was writer-in-residence at Hobart, Tasmania in 2007 and led workshops in Australia following her residency, before returning to Charlottetown, Prince Edward Island. She currently teaches courses on creative writing, children’s literature, and the work of L.M. Montgomery part-time at the University of Prince Edward Island. ​Deirdre has given hundreds of readings and writing workshops for all ages. In January 2016, she was appointed Prince Edward Island Poet Laureate. She has studied Iyengar yoga for a number of years. Always the slap of screendoor as we race outside. labels still vibrant, lids rusted shut. Did you have Prince Albert in a can? from a stick to something else. every outing something bright and new. The creature stops. Again it is a stick. Published in Afternoon Horses (Acorn Press, 2009). Critical Analysis: "Things are Just Things"
Kessler’s poem “Walking Stick” is an imagist piece concerned primarily with the nature of childhood and growing up. The poem is largely dominated by images of childhood nostalgia and innocence, as demonstrated by the speaker’s need to escape to the outdoors. The speaker associates the indoors with prison and likewise, nature with freedom where “everything is available at once” for play and exploration (2). The titular walking stick therefore becomes a plaything of childhood imagination; a creature with a head and eyes and, presumably, a story that is never told before it transforms back into a stick (23-24). labels still vibrant, lids rusted shut (6-10). The idea of hauntings by ghosts from the past is frequently explored in fiction and poetry; but, as a child, the speaker has no shadow memories of their own. Their introduction to the idea that will someday become reality is through the relics left behind by previous owners of the farm. The worn-out harness and harrow, outdated pieces of farming equipment, are ominous images of aging which interrupt the speaker’s play. The tins also play into this fear of growing up. The brother’s joke about Prince Albert suffocating in a can circles back to the speaker’s declaration of “Free again!” upon exiting the house (2). There is a correlation between the house, which the speaker sees as something confining and to be escaped from, as well as the tins, which are rusted shut from aging despite their vibrant labels. Though the speaker’s brother is telling a joke, this underpinning correlation gives it a saddening edge, one in which the tins become a symbol of adulthood and perceived confinement. Ultimately, “Walking Stick” is an imagist poem about a child’s growing awareness of the reality of growing up, where sticks are simply sticks. Metaphorically, the poem invokes a message that sometimes, despite the fantasy and dream reality we place on objects and our lives, things are just things and deserve no grandiose make-believe. Kessler, Deirdre. “Walking Stick.” Afternoon Horses. Charlottetown: Acorn Press, 2009. 37. Print. ---. Bigfoot Sabotage. Charlottetown: Ragweed Press, 1991. Print. ---. Brupp in the Land of Snow. Charlottetown: Ragweed Press, 1989. Print. ---. Brupp on the Other Side. Charlottetown: Ragweed Press, 1986. Print. ---. Brupp Rides Again. Charlottetown: Indigo Press, 1995. Print. ---. “Gateleg Table.” Writing on the Wall Series. Charlottetown: Confederation Centre Art Gallery & Museum, 2003. Print. ---. Home for Christmas. Halifax: Nimbus Publishing, 1989. Print. ---. Lena and the Whale. Halifax: Nimbus Publishing, 2002. Print. ---. Lobster in my Pocket. Halifax: Nimbus Publishing, 2010. Print. ---. Mother Country. Ottawa: Oberon Press, 2014. Print. ---. The Private Adventures of Brupp. Charlottetown: Ragweed Press, 1983. Print. ---. Rearranging the Sky. Charlottetown: Indigo Press, 2007. Print. ---. Spike Chiseltooth. Charlottetown: Ragweed Press, 1989. Print. ---. Subtracting by Seventeen. Charlottetown: Saturday Morning Chapbooks, 2005. Print. ---. “This Is a Dream War.” Artists for Peace. Lethbridge: Blue Grama Publications, 2004. Print. --- and Douglas Baldwin. The Charlottetown Conference and the Birth of Canada. Halifax: Nimbos Publishing, 2015. Print. --- and Brenda Jones. Born! : A Foal, Five Kittens, and Confederation. , 2014. Print. Buckner, Phillip. "Deirdre Kessler and Douglas Baldwin, The Charlottetown Conference and the Birth of Canada." British Journal of Canadian Studies 30.1 (Spring 2017): 121-122. Print. Kessler, Deirdre. Deirdre Kessler. Web. 12 Nov. 2015. “Member Profile: Deirdre Kessler.” Writer’s Union of Canada. Writer’s Union of Canada. Web. 12 Nov. 2015.